On Wednesday 25th May we bade farewell to the class of 2016. 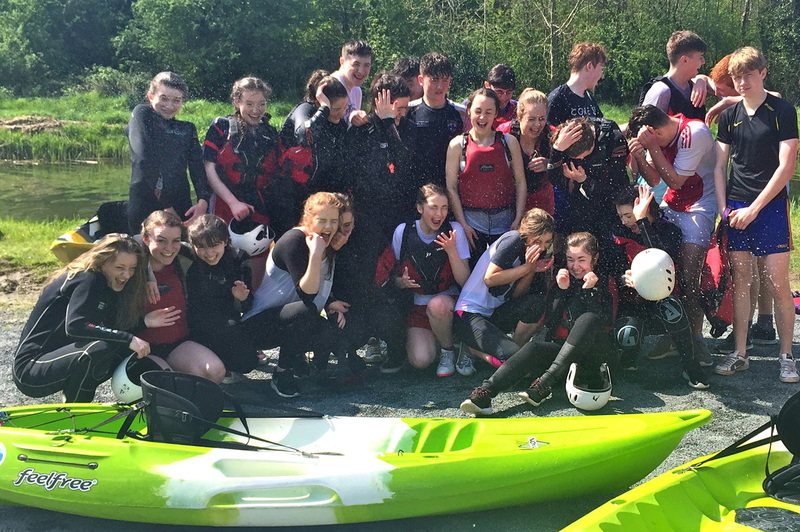 It was a day of fun and laughter, tinged with a little sadness as the 6th years spent the last day in St. Mary's. The day started with breakfast in the canteen, followed by lots of fun and activities, and then back to the canteen for some lunch. 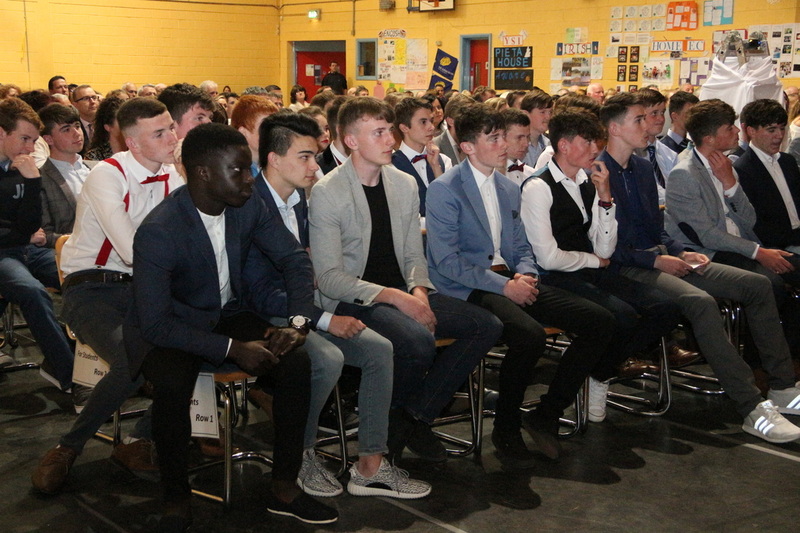 In the evening the graduation mass was concelebrated by Bishop Denis Nulty and Fr. McEvoy. 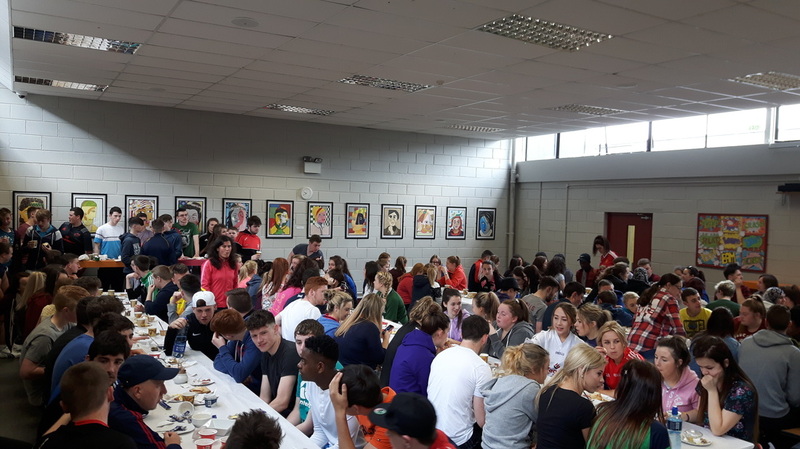 The management and staff would like to wish all the 6th Year students the very best of luck in the forthcoming exams and all the best for the future. 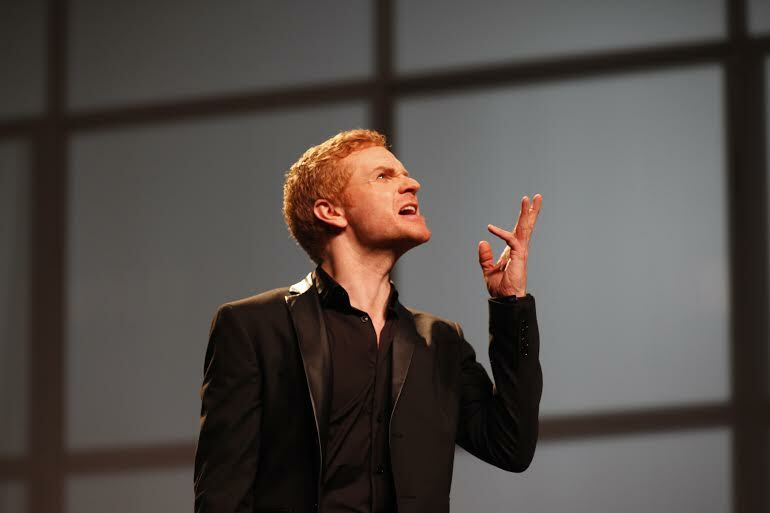 On Thursday night the school auditorium was packed to capacity for a very special concert performed by past pupil Liam Lawton, accompanied by the RTE Concert Orchestra and our own St. Mary's choir. All who attended were treated to a spectacular night of music, song and entertainment - a night that will long be remembered by all who there. the RTE Orchestra, the School Choir and Ms. Brady and most especially the Parents Association who put in so much time and effort into organising the whole event. 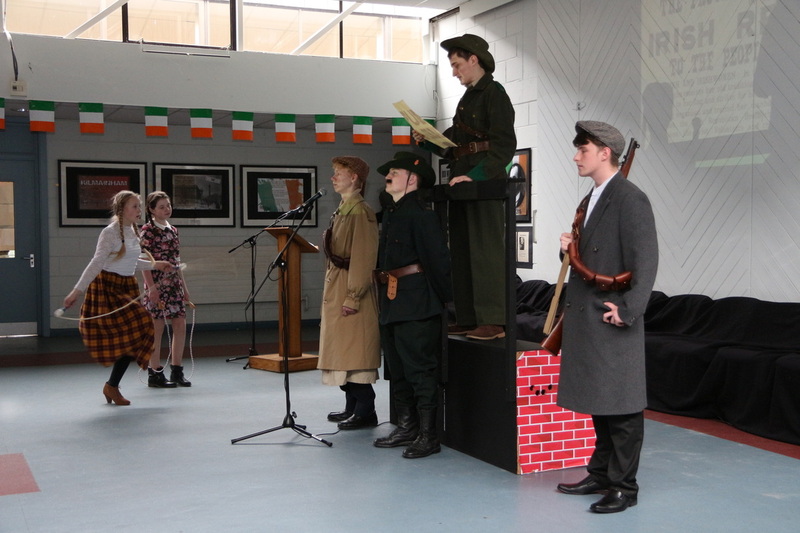 After many weeks of preparation and rehearsals the students of St. Mary's produced a wonderful enactment of the events of 1916 on Friday 8th April. This pageant production comprised poetry recital, traditional Irish music and singing as well as a very moving dramatisation of the events around the 1916 Rising. 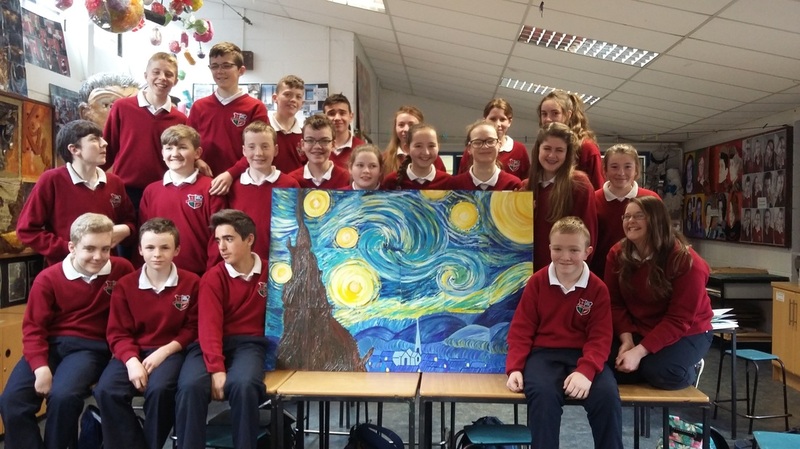 Well done to all students involved and to Ms P. McNamee and Mr. M. Nally who produced the event. 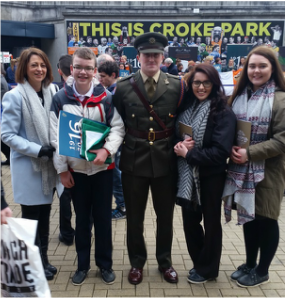 The Tricolour was proudly received on behalf of the school by 1st Year James O’Meara accompanied by Amy Boyhan and Lauren Cullen of 6th Year , along with Mrs O’Kelly and Ms A Lawton at the National Flag Post-Primary Ceremony in Croke Park, marking the start of St Mary’s Programme of Commemoration. 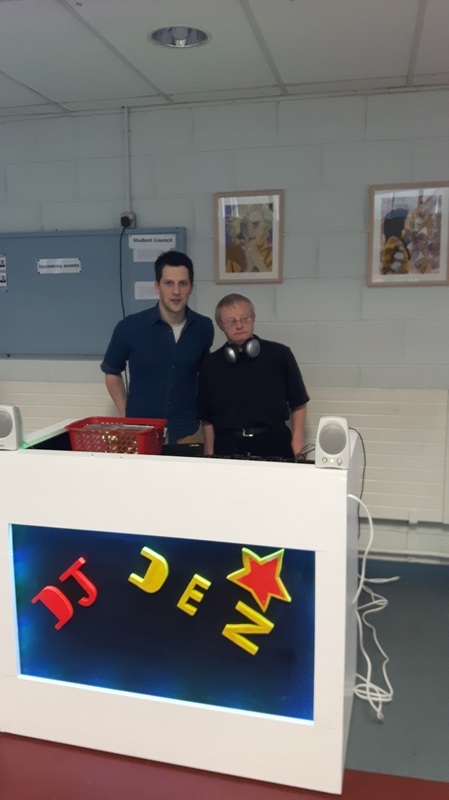 As reported earlier, 4 LCA students took on a project of making a DJ booth for DJ Des from the St. John of God Centre in Dublin. 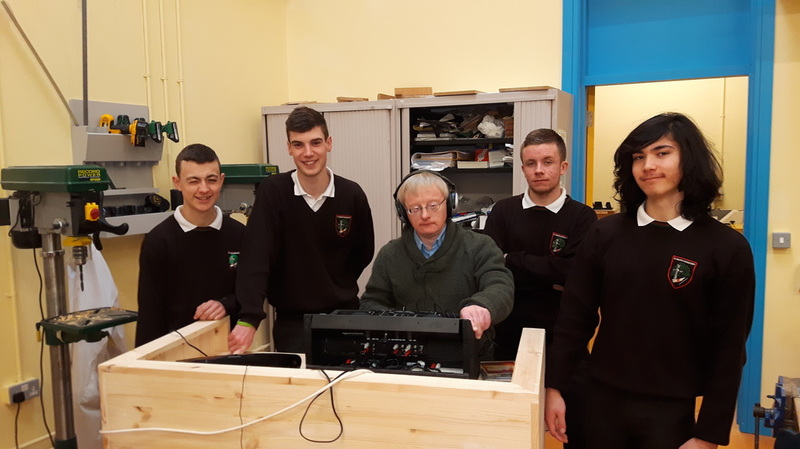 Des, who is the centre's resident DJ required a mobile desk that would enable to set up his equipment quickly and easily and so with the help of their teacher Mr. Mitchell the 4 students, Jordan Lally, Michael Haslam, Christian Brennan and Jordan Connolly took up the task of making the desk. After many months of hard work the unveiling if the desk eventually happened in the school GP area recently. On the day Des was on hand for the unveiling, and after inspecting his new desk and expressing his gratitude to the students, Des entertained the students during lunch-time with an impromptu DJ set. He then had to rush away as he was DJing later that day at the centre's Valentine's Night Disco. We hope DEs enjoys his new desk and will be entertaining all in the centre for many years to come. 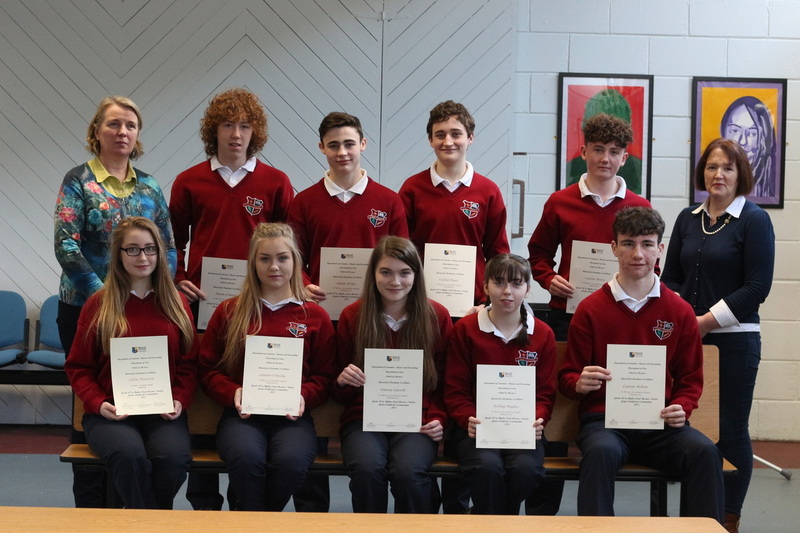 ​Congratulations to nine students from St. Mary’s who were presented with awards for excellent achievement in Junior Certificate business Studies at a recent awards night in the National University of Ireland, Maynooth. The Department of Economics, Finance and Accounting presented the awards at a ceremony held in the university. The award cited the excellence of teaching and acknowledged the achievement of Grade A in Higher Level Business studies in the Junior Certificate Examination 2015. 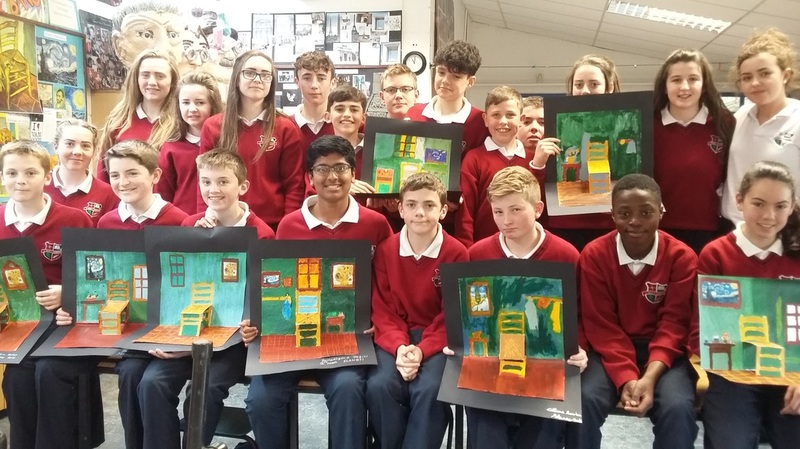 The students who received the awards were Simone Carroll, Ciaran Holton, Lauren O’Reilly, Cathal Ryan, Adam Keyes, Chloe Pearson, Mark O’Hara, Aisling Hughes and Ciaran Breen. 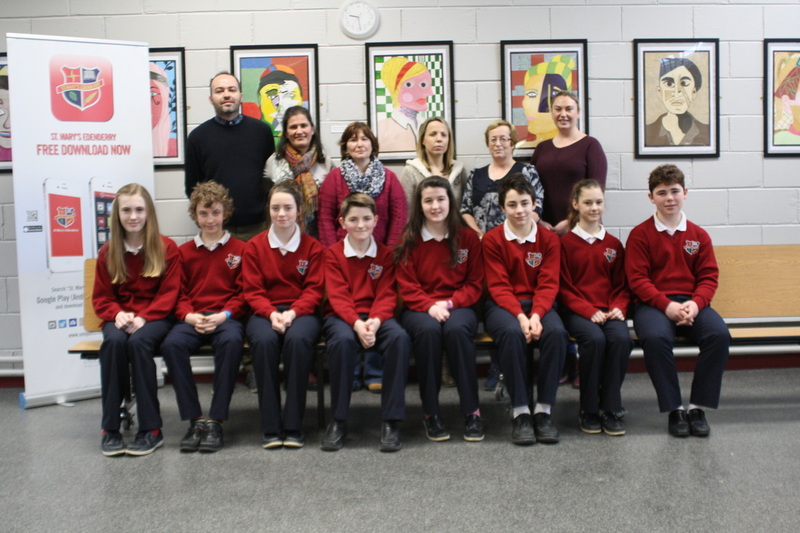 Congratulations to all for their hard work and excellence and also to their teachers Mrs. Potterton and Mrs. Coughlan. 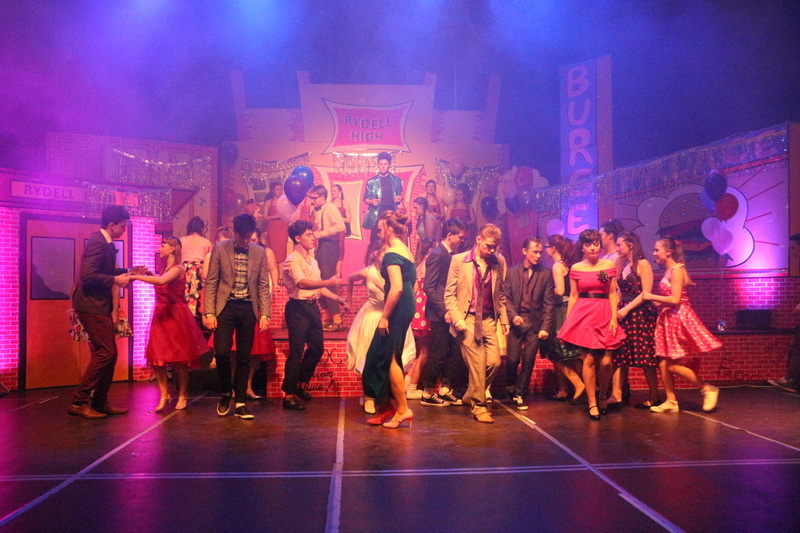 ﻿Congratulations to all who were involved in our school musical - Grease which was an outstanding success. The school gym which was transformed into an auditorium fit for the West End was packed to capacity each night and all those who attended were treated to an evening of high class acting, singing and dancing. A big THANK YOU to all staff, students and parents who were involved and to all those who attended each night. 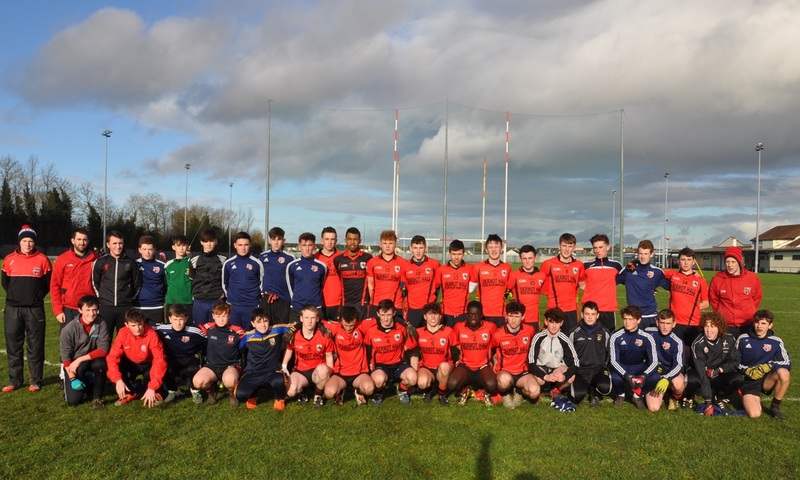 Our U16 Football Champions were invited to attend the 1st Round Championship match between Offaly and Longford in O'Connor Park last Sunday. 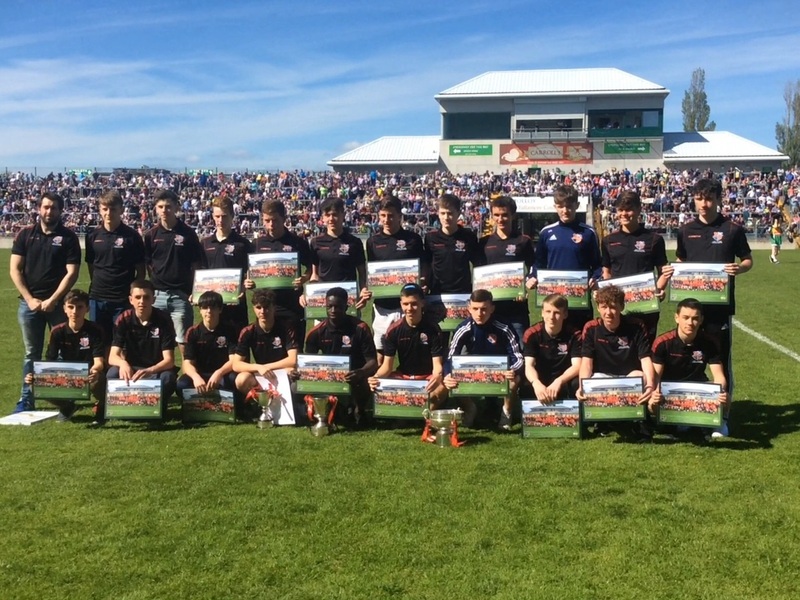 At half time their super achievement was acknowledged when the team were presented to the spectators at the match and were presented with a team photo as a memento of their success. Congratulations again lads. 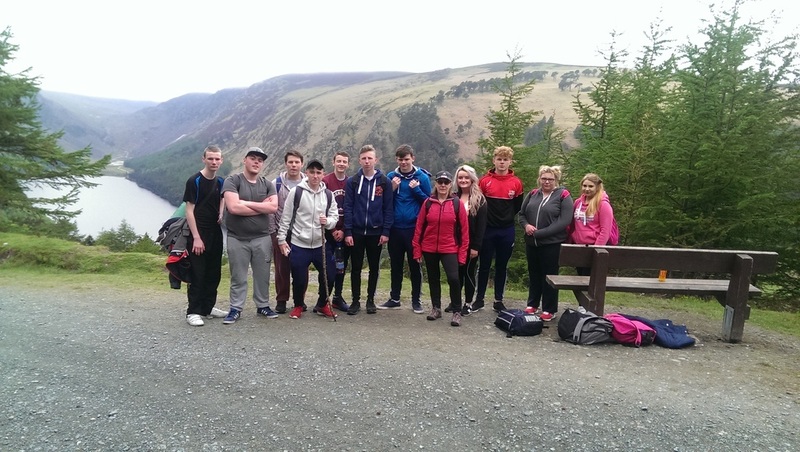 Well done to the YSI class from TY who were involved in helping with the Darkness into Light Walk. The dedicated students arrived in the school at 2am to help in setting up the school gym for the event. They also got students to bring in jam jars which they had to wash and on the night they placed candles in them and placed them along the route. After doing all this preparation they then went on the walk. 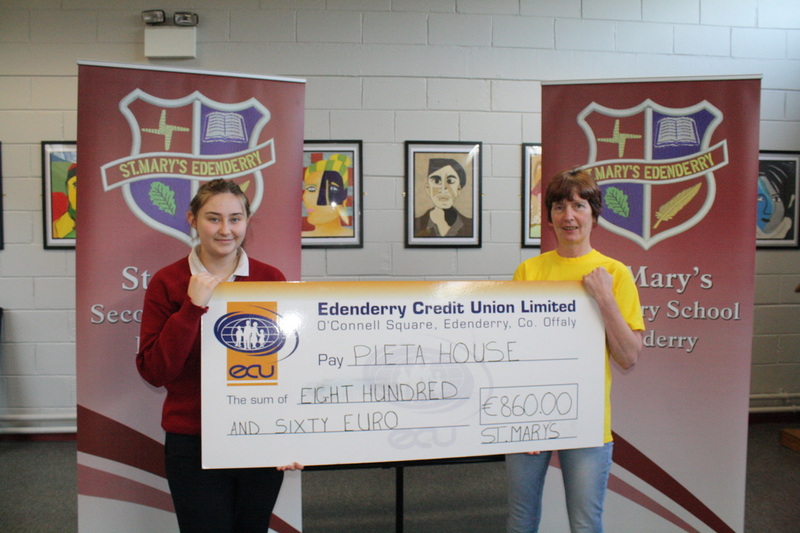 The students also held a fund raiser for Pieta House and raised €860. Well done to all involved. 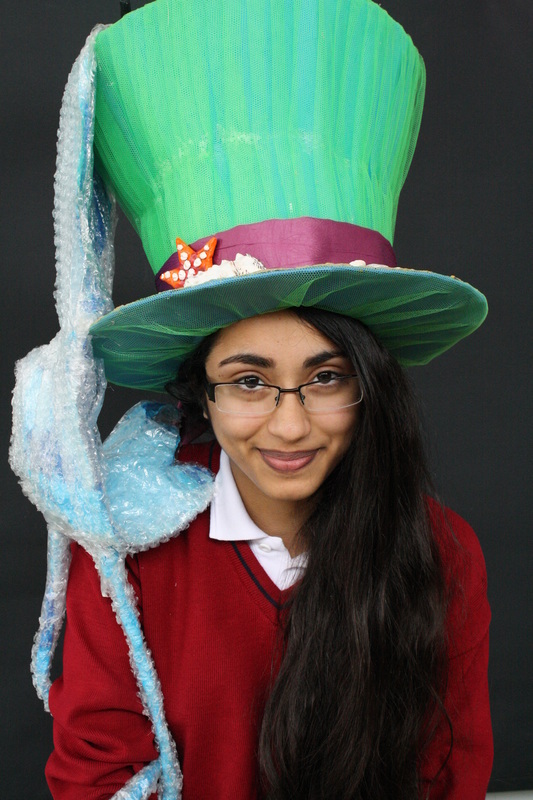 ​Second year Art and Design students have designed and made the most bizarre top hat sculptures over the past number of weeks. The brief was to design and make a hat to be worn based on the title: ‘Head full of Dreams/Nightmares’. 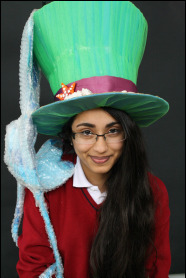 The students chose a wide variety of themes to base their hat sculptures on, not to mention the extensive selection of materials used throughout. The results have been truly amazing! The students even surpassed their own expectations! They brought all the work to fruition by staging their own fashion show for first year students and teachers in the school canteen. A feast for the eyes and we think even Philip Treacy would have to agree! 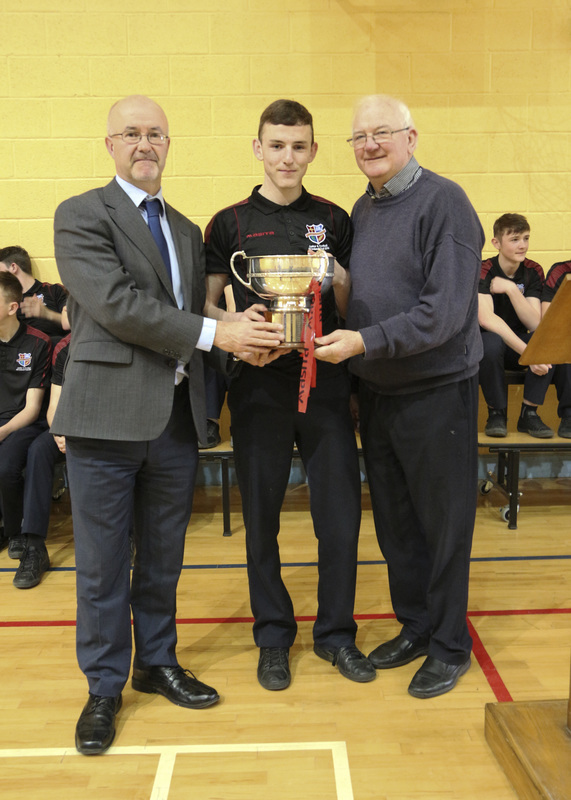 The whole school community gathered in the school gymnasium last Tuesday 5th April where the victorious Under 16 football team presented Mr. Halford, school principal, and Fr PJ McEvoy, school manager, with the Paul McGirr Cup which they had won in the All Ireland A Colleges Under 16 Football Final. Saturday March 26th will go down as one of the most remarkable days in the history of sport in St. Mary's Secondary School. 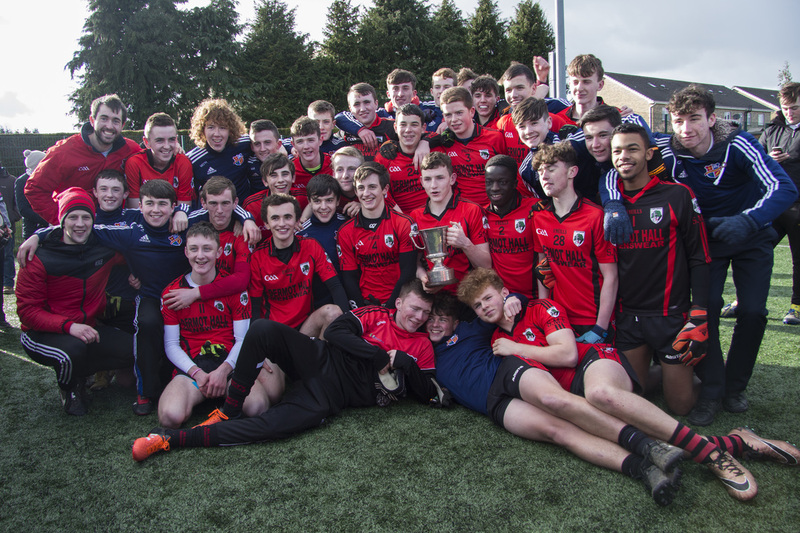 Our Under 16 footballers pulled off what can only be described as an heroic and amazing victory in the All-Ireland Under 16 A Championship against Patrician College Carrickmacross with a final score-line of 1-11 to 1-10. From 4 points down, a man down and playing into a gale- force wind the lads never gave up and with a remarkable display of determination turned the game around to lead by four points and eventually win by a solitary point. A hugh WELL DONE and CONGRATULATIONS to all the team and mentors Enda Mitchell, Eamonn McFadden and Ciaran Farrell. 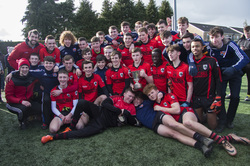 Well done to our Under 16 footballers who won the U16 Leinster A Championship for the first time in the history of the school. 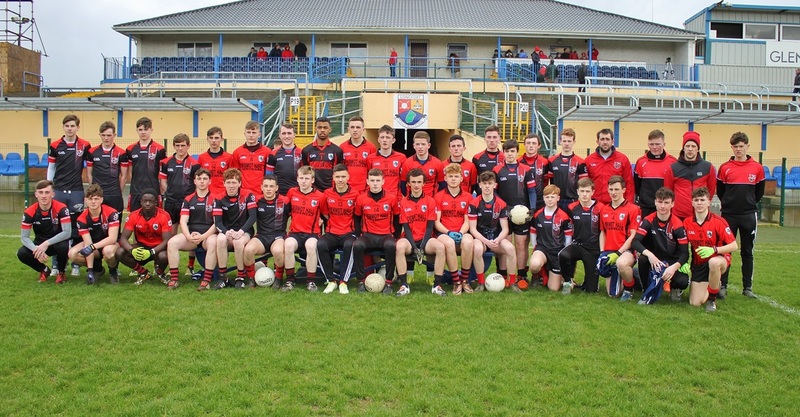 The boys totally out-classed St. Pat's of Navan in Mullingar last Friday winning with a score-line of 2-11 to 8 points. 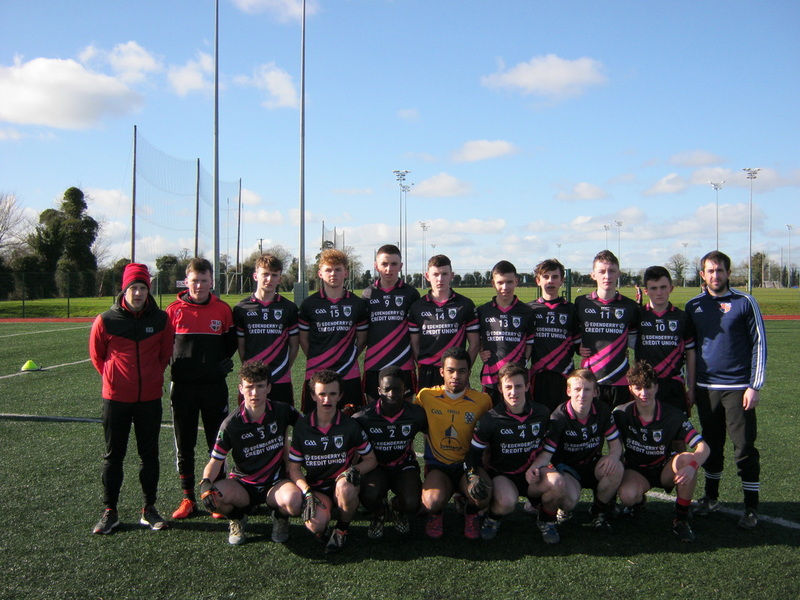 Well done to all the boys and to Mr. Mitchell and Mr. McFadden. ​Click on the link below for match report and pictures. 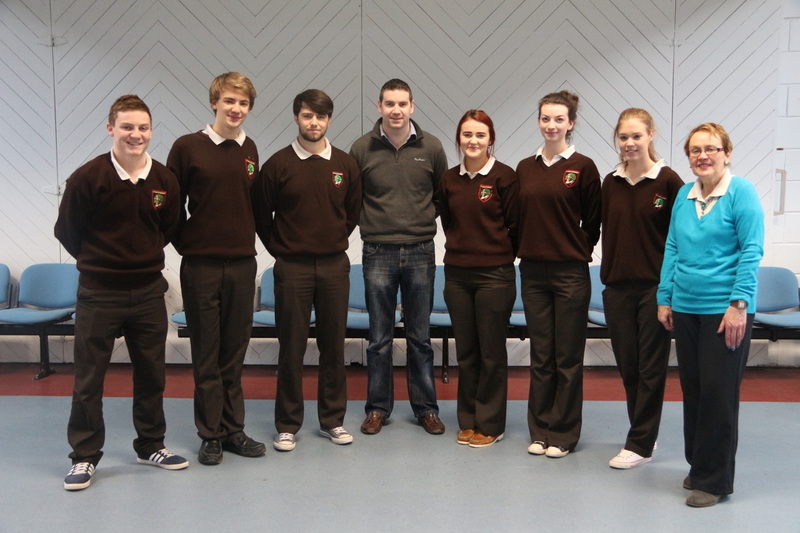 ​On Thursday 28th Jan.Dr.Ciaran Reilly gave a talk to students on ''Edenderry and the 1916 Rising''. It was an excellent talk and the large number of students really enjoyed hearing about life in the town at the time of the Rising.Dr Reilly gave two Talks,one to junior Cert students and one to Leaving Cert Students.St Marys has a very large number of Students taking History and they found the Talks extremely beneficial,especially the Leaving Cert students. Dr Reilly spoke of the role played by local Edenderry people in The First World War and also the 1916 Rising.He also spoke of divisions in the local community with some local people taking a pro British stance while many others were on the opposing side taking the republican side. Also attending the talk was local Historian Ms Mary O Connor.Dr Ciaran is a past pupil of St Marys Secondary and Ms Mary O Connor is a former Teacher of History at St Marys .Dr Ciaran's interest in History began as a young student in Ms O Connor's History class and it was a great honour for St Marys to have both distinguished guests attending. Principal Mr Rob Halford,thanked Dr Reilly for giving the students a wonderful insight into life in Edenderry in the 1916 Era and wished him well for the coming year. 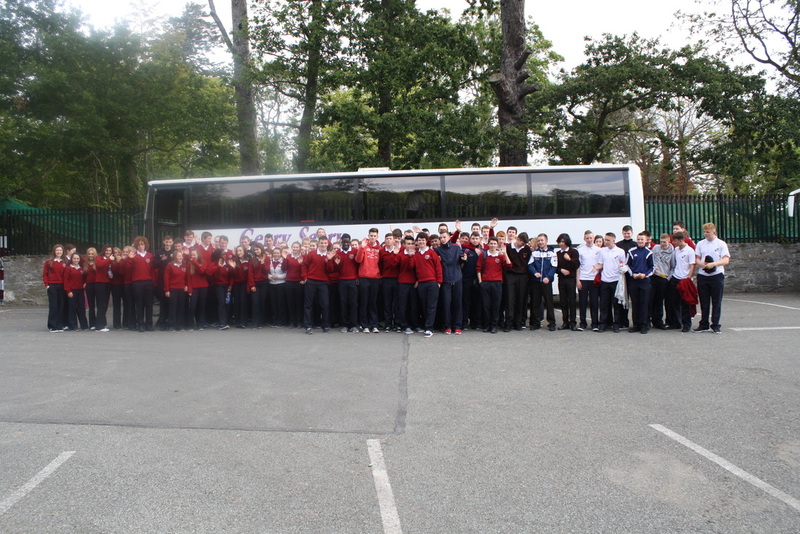 On Thursday last our 6th year LCA Graphics and Construction students had a visit from Des who is a resident of the Saint John of God Centre in Dublin. The students had previously visited Des to discuss plans for a DJ booth for his regular DJ slot in the centre. The students, Christian Brennan, Jordan Lally, Michael Haslam and Jordan Connolly have been hard at work on the booth and invited Des to come and look at the progress. 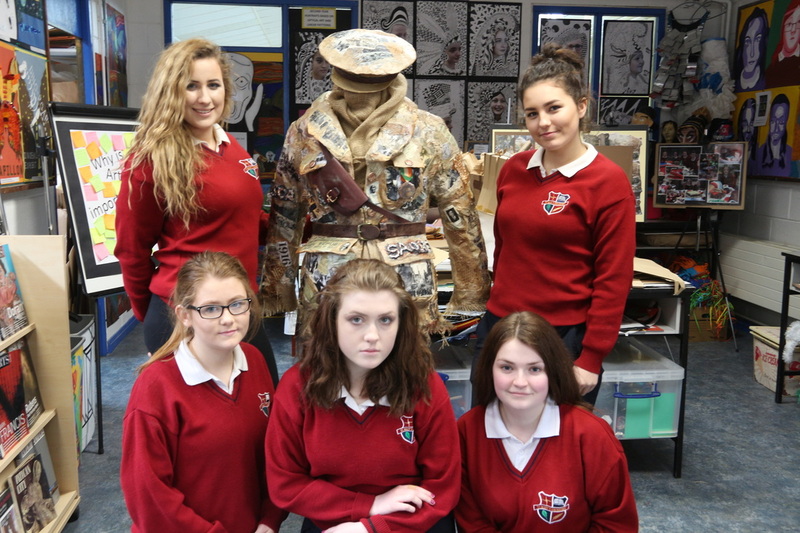 The students had great time discussing the work they have with Des and he was very happy with the design. The students hope to have the booth up and running so that Des can use it for his Valentines night event in the centre. ​Below is a picture of Des testing out his decks on the new desk. ​The Irish Senior Rugby Squad recently trained at The Johnstown House Hotel & Spa in preparation for their Summer Tour to South Africa in June. Two students from each year in our school got the opportunity to attend the closed training session thanks to our teacher Mr. Reehill. There was a squad of 45 players and the coaching team including Joe Schmidt and new defense coach Andy Farrell, who was working with the team for the first time. 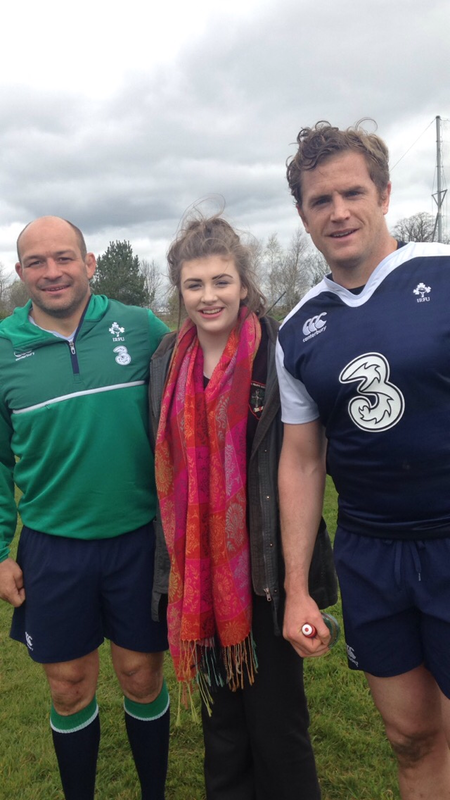 We met players from each province such as Jamie Heaslip, CJ Stander, Sean O’Brien, Devin Toner, Rory Best and Johnny Sexton to name but a few. It was a brilliant experience and we all really enjoyed it. 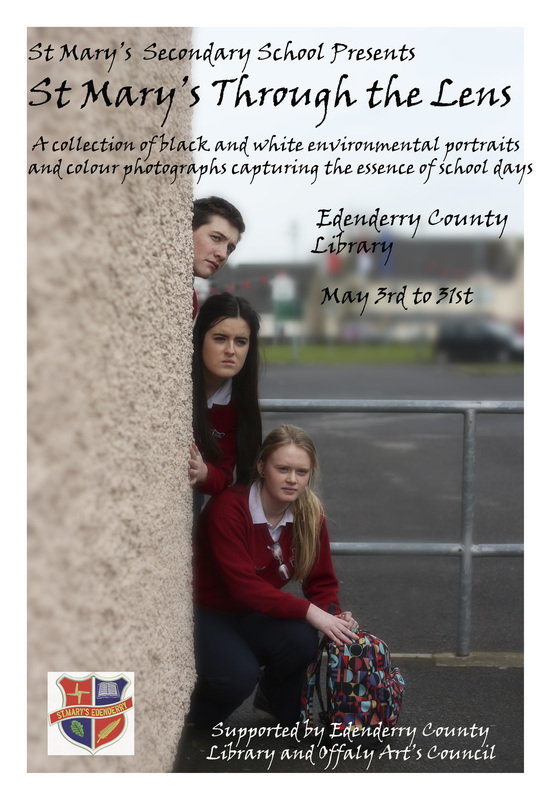 ​On Wednesday May 11th at 7pm in Edenderry County Library, the photography exhibition St Mary’s Through the Lens was officially launched. The two part exhibition, showing the work of 40 Transition year students in photography, was jointly opened by Sean Wynne, former chairman of Portlaoise Camera Club, and Mr Halford, Principal. 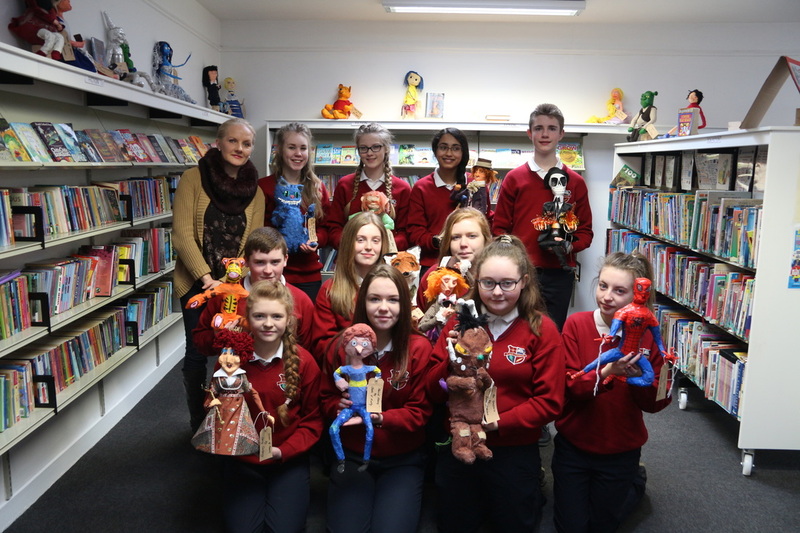 Ms Galisson, the photography teacher, extended her thanks to her Club, the Library, the Art Council, her colleagues Fiona Farrell and Liam Mc Grath as well as the Management and Staff of St Mary’s who took part in the project for their support. The exhibition remains opened until the end of the month. ﻿March 15th was a very special day for staff and students in St. Mary's when the whole school celebrated Proclamation Day. Proceedings began in the school assembly area when representatives from each class attended a special ceremony to mark the day. The ceremony began with Mrs.O'Kelly welcoming everyone present, including Fr. McEvoy, the Parents Association and two special guests from the Armed Forces - Sergeant Paddy Clarke and Sergeant Brian Ankers. Mr. Nally read out a piece about the Irish Tri-colour, Mary O'Connor read the Irish Proclamation in Irish followed by the English version read by Cathal Ryan, Katie Gallagher read out her own Proclamation reflecting the hopes and wishes of today's young people and finally the school choir sang Amhran na bhFiann. 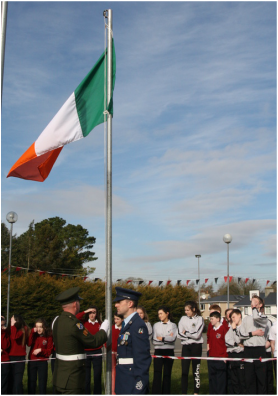 Sergeants Clarke and Ankers were then invited to bring the National Flag outside where the whole school was waiting in a Guard of Honour, and raise the flag. They were lead outside by a lone drummer, Arman Duzel, and after the raising of the flag, Cathal Ryan read the Irish Proclamation for all students. Proceedings came to an end with a beautiful rendition of The Foggy Dew by Laura Cole and Shane Hurst. 5th Year English students along with their teachers Ms. Malone, Ms. McNamee and Ms. Lawton attended a production of Shakepeare's Hamlet in the Helix theatre in DCU. 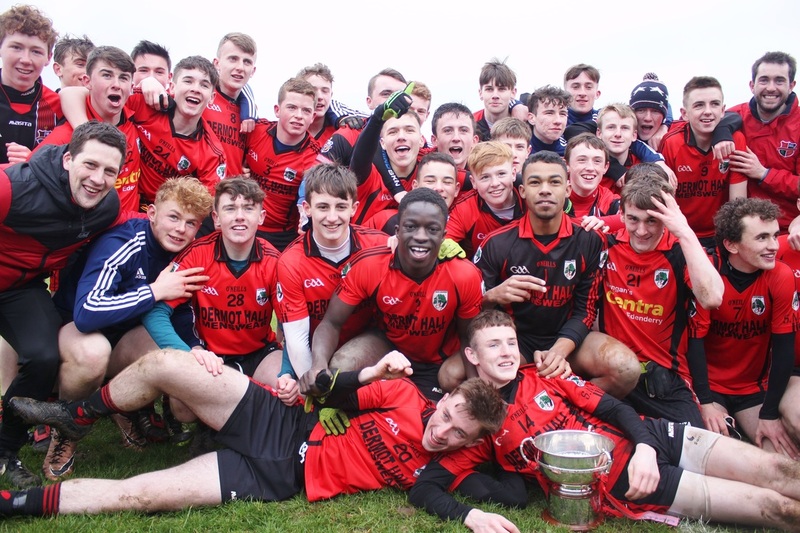 Click on the link below to read Eanna Lowry's report. 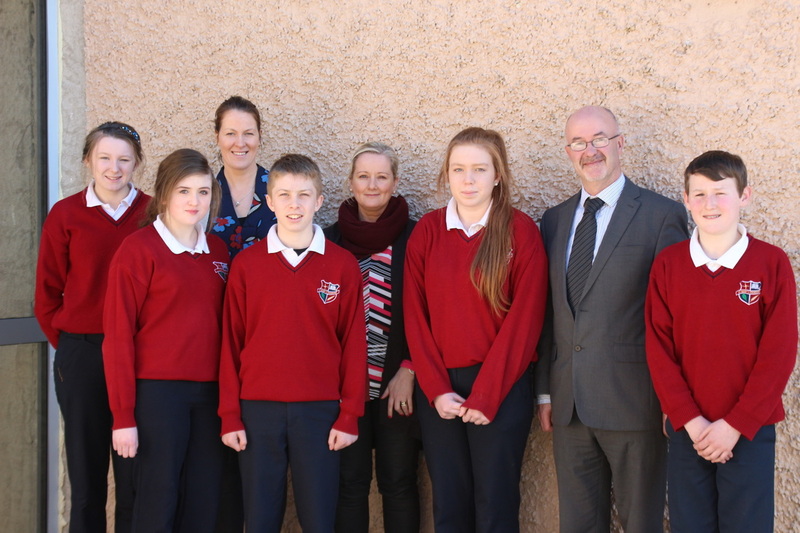 Congratulations to Aoife Jenkins, Conor Gallagher, Avril Donegan, Ciara Farrell, Megan Rainey and Lee Pearson who have been awarded scholarships to attend Colaiste na bhFiann Gaeltacht this summer. 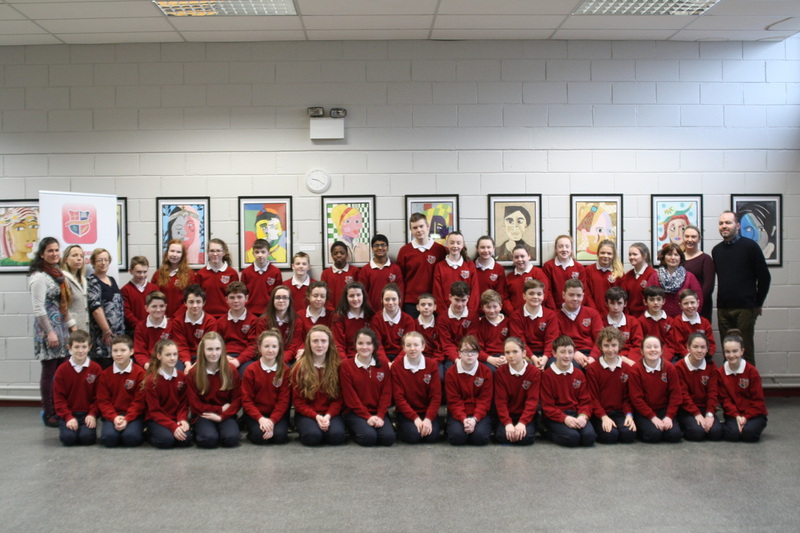 First years students in St. Mary’s Secondary School attended an anti-bullying workshop facilitated by Jolante Burke from Trinity College Dublin, last 1st of February. 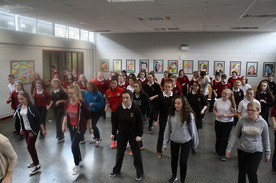 This workshop was organised by the anti-bullying team in the school as part of the promotion of positive mental health in St. Mary’s. Ms Burke delivered a very engaging workshop explaining what constitutes bullying and the types of bullying (repeated physical, verbal aggression, repeated isolation, repeated extortion and cyber-bullying). Students were able to see the dangers of cyber-bullying, since any other type of bullying requires the action to be repeated, whereas cyber-bullying does not necessarily have to be repeated, as technology allows for the incident of bullying to be shared and, through this, the list of potential perpetrators grows in geometrical progression. Our students, during an evaluation session, highlighted the importance of standing your ground, talking to someone and reporting any incidents of bullying in order to ensure that our school continues to be a bully-free school. They also mentioned the work that was done in relation to bullying during primary school. They felt the workshop benefitted them in terms of being more aware of what bullying is, of how the perpetrator is often the person who has the issue and the scars (both physical and psychological) it can cause to a victim of bullying and their self-esteem. 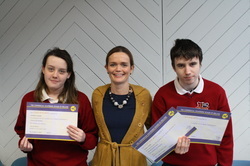 Congratulations to Leanne Cusack, Conor Daly and Dylan McGrath who recently received certificates from the Dublin Examining Board for completing modules in Microsoft Word and Excel. Leanne and Conor are pictured above with their teacher Ms. Malone. 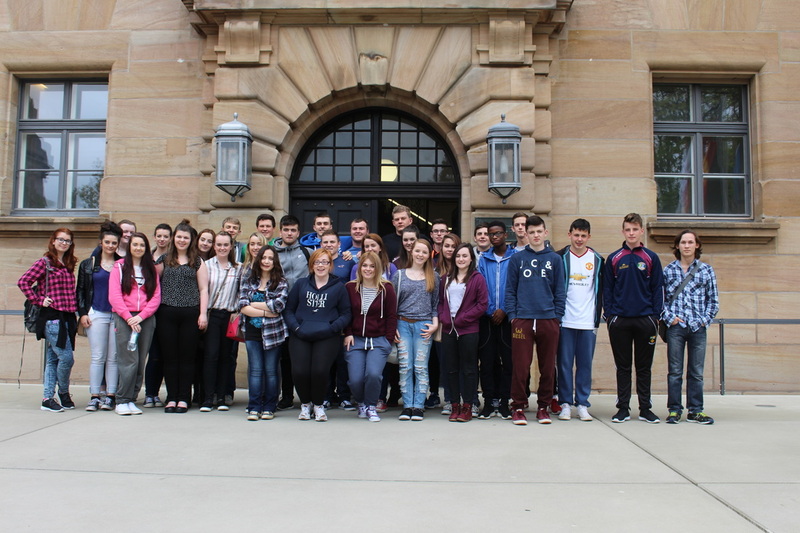 St. Mary's would like to congratulate all our Leaving Cert students on their success in the Leaving Cert. A very high number achieved an A grade in honours English, with 92% of the students who took the Higher paper obtaining a grade C or higher and 92% of the students who took the Ordinary level obtaining a grade C or higher. 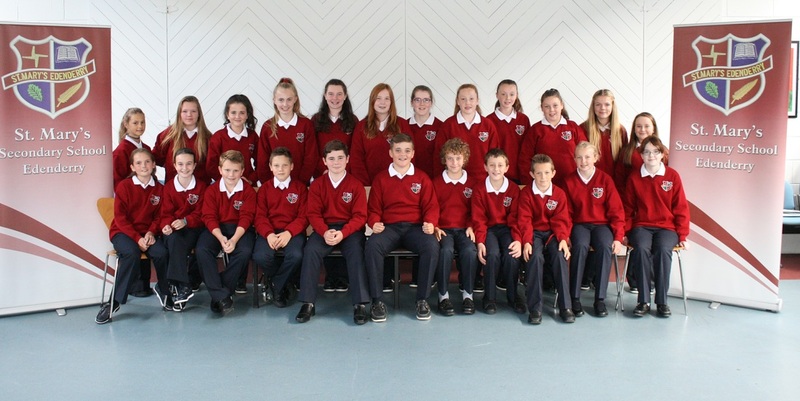 100% of students who took Irish at higher level received an honours grade - compared to the national average of 88%. 85% of students who took Maths at higher level received an honours grade compared to the national average of 71%. 90% of students who took Ordinary level received a C grade or higher - compared to 74% nationally. 15% of students taking Higher level Maths received an A grade - 4% higher than the national averages. The school is delighted that so many of our students got the required points to pursue their preferred university course. As a result 85% of our students will be attending 3rd level colleges and universities in the Autumn. As well as these magnificent results, the school was delighted to learn that it has jumped 20 places in the recent Sunday Times Top Schools in Ireland Survey. 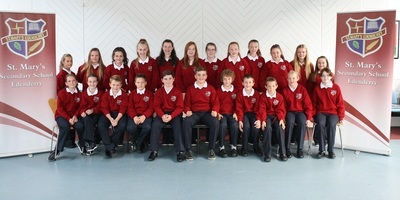 St. Mary's maintains its position as the top feeder school to 3rd level in North Offaly. 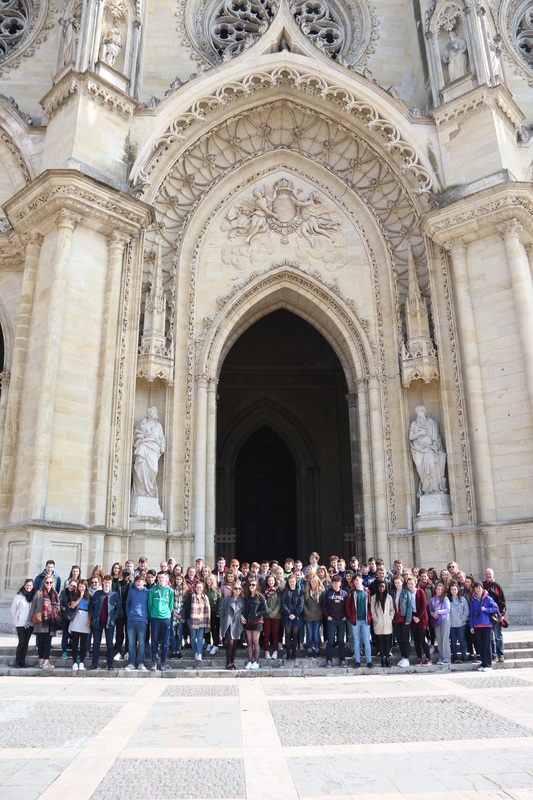 ​TY and LCA students visit building exhibition.